You don't have to be a home-schooler to benefit from these workshops—and you can't beat the price—only $35/individual, $45/couple for a two-day conference! Register here. 2. How Do I Know If I'm Being a Good Parent? 3. How Do You Create and Sustain a Healthy Family Culture? 4. How Do I Overcome Self-Doubt as a Parent? Vids 5-8 will be posted every few days prior to the conference. Stay tuned. "When you give your children knowledge, you are telling them what you think. That is, you are telling them what they are supposed to know, what you want them to understand is true. "When you give your children wisdom, you do not tell them what to know, or what is true, but, rather, how to get to their own truth." There is much that our children need to be taught of right and wrong. That is certainly important. In addition, what is even more important is that they be taught not only how to think, but how to know themselves enough to learn to know their own authentic truth. This they must learn to do on their own. They do need guidance, but guide. Don't take over. As soon as you get into lecture mode is where you take over their thinking and they become resistant to your teachings. Be careful that while you teach that you don't do their thinking for them. The best strategy for this is to speak less than you ask questions. Then listen long and draw out their thinking and ideas. Explore and support their thinking with them where you can. Respectfully challenge their thinking when it needs to be. Dads, Do Your Kids Know? "Every child deserves at least one adult who is absolutely crazy about them." Amen! We, as fathers, are uniquely poised to be that one to provide our children with the love and protection that only we can provide and that they so desperately crave and deserve. Today, and frequently, I'll find simple verbal and non-verbal ways to let them know they are loved by their father. For example, today in church I passed the above sheet around to the fam with the simple beginning sentence string of "Em is..."
"...freakin' awesome ...smart ...different ...musical ...spazzy ...cool ...nice ...unique ...funny"
This is the self-concept I am pleased to see a 13-year-old young woman develop as she prepares to enter adulthood. "...my DEAR daughter whom I love, am proud of, makes me laugh, is talented, bright, is AMAZING to me, is lovely in every sense of the word, and is the joy of my life!!!" ...has ticklish bunnies [inside joke], has a great sense of humor, is beautiful inside and out, talented in so many ways, a good friend, a good girl, and I love her!" Her siblings added a few extra nice and silly things as well. How likely do you think a young woman with this kind of self-concept is likely to put up with being treated poorly by a guy? How confident do you think she'll feel to try new things? Will she have a place of internal security and refuge to turn to with this sense of self when she goes through the dark times of self-doubt that besiege us in this life? As you can see, it's a lot more than just a little activity to keep us occupied during a church meeting. As they face a difficult world that often doesn't make sense how crucial it is to hear, and to KNOW, that the most significant and powerful man in their lives is "absolutely crazy about them". This knowing creates a sense of security and identity that will protect them through all their life's struggles in a way no other force can. Without that powerful knowlege, insecurity and a weak sense of self flourish. Dads, you are needed. You need to be powerful in your children's lives. They need to daily know of, and see, your love for them. It can be as simple as many sincere, simple and silly little methods as the one above. So to the great dads out there, and to the ones who are turning it around, I wish you a Happy Fathers Day. Let them KNOW of your love for them. Don't ration it out. Flood them with it. PARENTING FINESSE TIP: ”Teach Your Kids to "Fail" Gloriously"
Teaching Kids to "Fail" Gloriously! Last night for our Family Night I taught an activity on making mistakes, failing and never giving up as the path to succeeding in life. Here's all the stuff you need so you can do the same with your family. 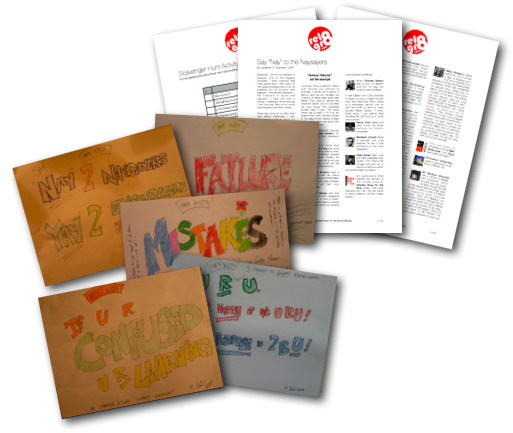 Download and print out a copy (pages 1-2) for each person of my "Say 'Nay' to the Naysayers" article which lists many Famous "Failures" and one copy of the "Scavenger Hunt List" (pages 3-4). Don't let them see the answer sheet. Print out one copy of the "'Stupid', Mistakes and 'Failure'" coloring/discussion posters (there are nine total, only five are shown above). Or make your own, too. Place the Scavenger Hunt List, tape, crayons/colored pencils/markers in the center of the table. Have the group as a whole go get the scavenger hunt items and/or have each person pick two or three things they will go get. Don't tell them what the lesson is about yet. Once everyone has retrieved their items, hand out the "Say 'Nay' to Naysayers" article. Explain to younger children that "nay" means "no" and that "naysayers" are people who say things can't be done. Tell them that many famous people failed a lot before they were ever famous. Have them all read through the article and find the person their item goes with. Explain that failure doesn't always mean failure. That failure actually is the frequent path the successful take. Share the Japanese proverb for success: "Fall down seven, get up eight." The difference between people who fail and those who succeed is just not giving up. Have everyone take turns reading aloud to the rest of the group about the Famous "Failure" they found. Pass out the "'Stupid', 'Mistakes' and 'Failure'" coloring/discussion posters (you can do this one in the same activity or if attention is waning you can save this part for a follow-up lesson/discussion). Tell everyone that while they are coloring theirs you will go prepare the treat (we made Oreo shakes). As you are all enjoying your treat, have everyone take a turn showing their poster and reading it to the group. Let them share their thoughts on what it means and discuss. Have everyone take their poster and tape it up somewhere around the house (next to the bathroom mirror, on doors, on the fridge, on the wall next to the toilet, on the wall next to the back door, etc). Did you try the activity? Tell us about your experience? Whether or not you did the activity, tell us what YOU think about failure, mistakes, learning and success. Slow down and look both ways. When your children speak, take a moment to follow traffic basics: Stop. Look. Listen. Decide ahead of time how the both of you will handle difficult situations with your children. Anticipate problems and play “stop-gap.” This is where you look for ways your kids can get around you discipline and how you will “stop-up” those gaps. Offer solutions instead of yelling. Point out a way to be helpful. Tell your child what they can do or have versus what they can’t do or have. For example, “You are welcome to go play as soon as you ...clean up your toys” instead of “You can’t go play. You haven’t cleaned up your room yet.” Read that out loud. Can you hear and feel the subtle but significant difference? Your children will hear and feel it, too. This approach helps remove resistance and enhances cooperation. Refuse Undermining. Make a choice as parents to not undermine each other in front of you children. To say something like, “I sided with you, but Mom won” makes both of you look foolish in your child’s eyes. Does your Management Team know its Policies and Procedures Manual? Every company has one set of rules, their “policies and procedures,” that every employee is expected to follow. When everyone is on the same page the company is able to run smoother and there’s less conflict about what or how things should be done because expectations are clear. Churches and sports teams do the same. When there is a conflict everyone can defer, and refer, to the same rules versus getting stuck in arguments that go nowhere. Most organized groups do this. Families rarely do. Parents are the management team of the family. Decide on your discipline rules as a team and abide by them consistently. If you cannot come to a compromise that works, do what companies do when they get stuck: Hire a consultant. Seek help from a neutral third party whether that be clergy or counselor. Keep well-meaning, but biased, friends and family out of it. Want to start or join a "Great Relationships" Parenting Action Group"? Contact me. One parent recently contacted me seeking help for a common parenting problem: Power struggles. She stated that her child thinks she’s the boss, is defiant, does the opposite of what’s asked, and ignores her. Sound familiar? She lamented, as many of us have, “We’ve tried everything” and admitted that they end up resorting to yelling even though they know that’s not helpful.